Discount can be broadly classified into two types based on the place of its application. Price discount - This applies at the product price level. A simple example is: Get 10% discount on all products in Shoes category. In other words, this is also called as Dynamic pricing discount. This guide will walk you through various discount scenarios you can configure with the price based discount rules. Get 10% discount on all products EXCLUDING items on SALE. 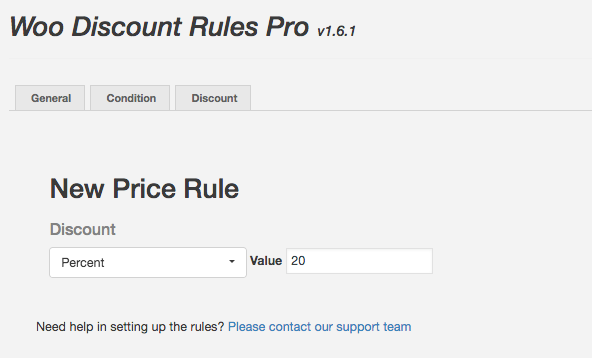 The above are typical examples of price rule based discounts that you can create. Let explore these two methods before we dive into some examples. Most of your discount scenarios will fit in to this method. All products in the store get 10% discount from June 1, 2018 to June 20, 2018. Order: The ordering of the rule. This is useful when you have multiple rules that might apply together or the first matching rule. Validity : You can fill in the start and end date of the discount rule or you can leave them empty for the rule to take immediate effect. NOTE: Leaving the TO field empty means the discount would run forever. Choose All Products in the conditions tab and check the box to count items cumulatively as we want to apply the discount to all products. 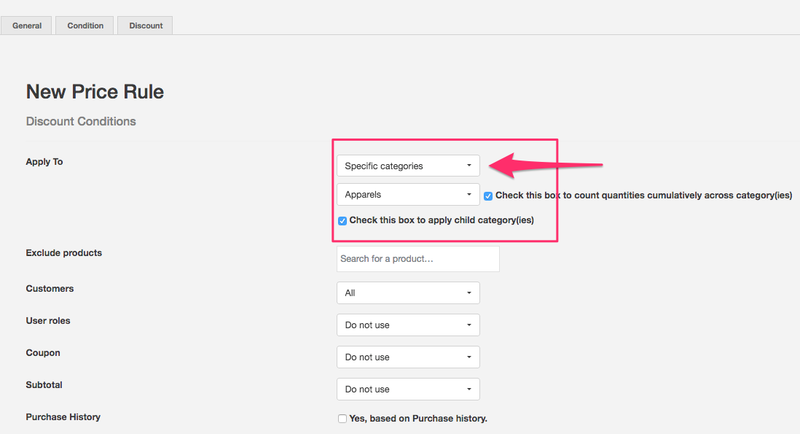 If you want to limit the discount to a few selected categories or selected products, you can do that as well. Here is where you configure the quantity range and the discount percentage. This means, a 10% discount would apply to any products purchased from the store. 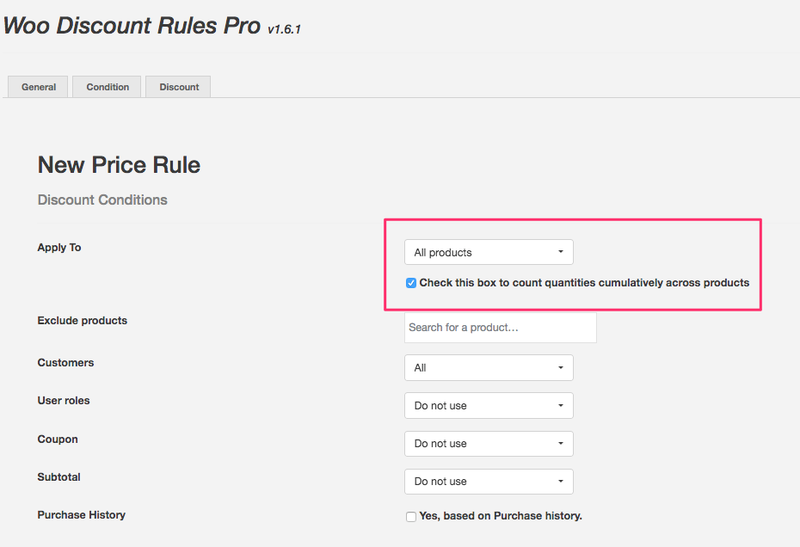 The following section will answer most of the frequently asked questions with regard to discount rules that are quantity based. 1. How to create a tiered discount. Example: 1 to 3, 10%, 4 to 6, 20% and so on. Simple. Just add more ranges. 2. How to provide a Fixed Amount as discount. In the adjustment type, choose Price discount and set a fixed amount as discount. Example: Buy any product from the store and get $2 discount. 3. How to restrict the discount to only Specific Categories? Example: Buy any product from Shoes category and get 10% discount. In the conditions tab, just choose the Apply To as Specific Categories. Then choose one or more categories. 4. How to provide a free product, Buy One Get One Free rule. Buy 2 products, get 1 cheapest among them free. 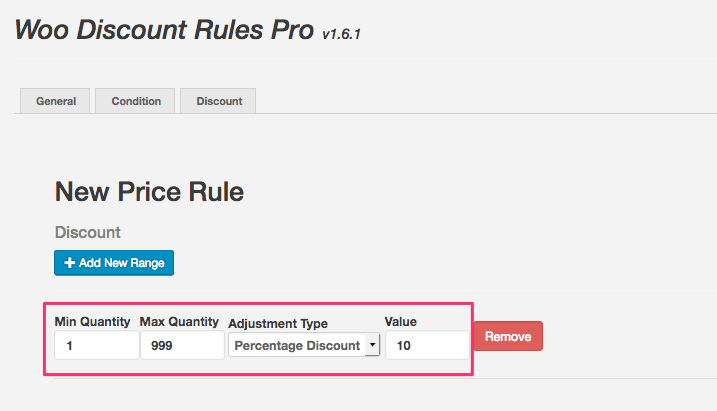 In the discount tab, you need to choose the Adjustment type as: Product discount. 5. 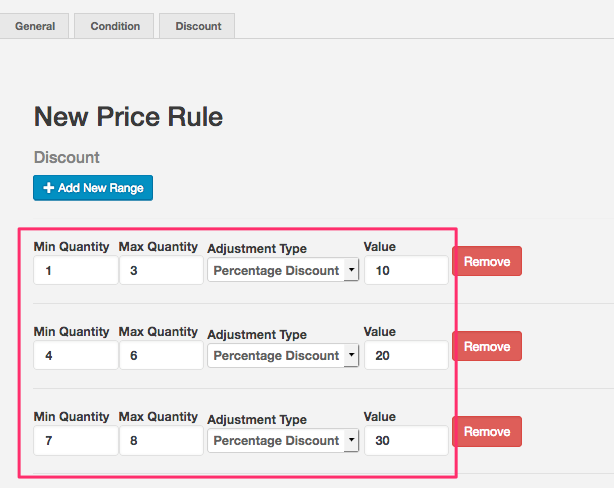 How to create a user role based discount ? 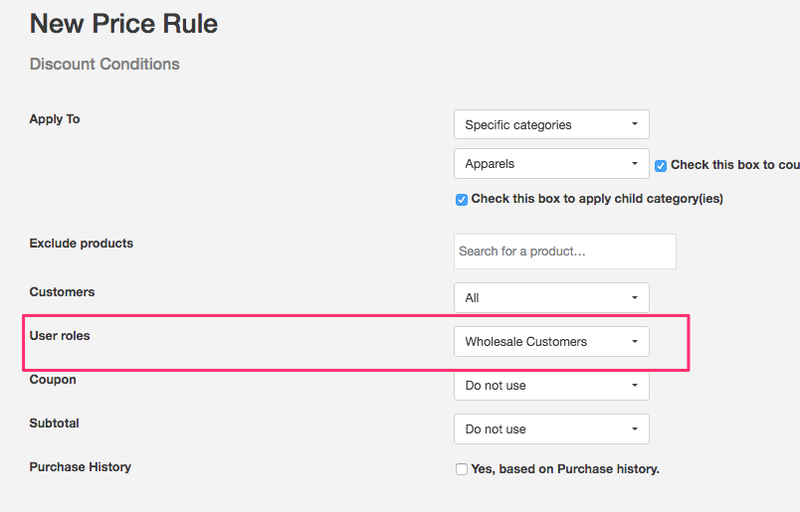 Example: 10% discount to users belonging to the Wholesale User role. IMPORTANT NOTE: You need a plugin like the User Role Editor if you want to create additional user roles and then assign users to those roles. Sometimes, you may want to provide a discount when customer purchased one or more specific products. Example: Buy Product A and get 20% discount on Product B. The customer can get a discount only if he purchases the Product A. You can also create rules like: Buy at least 1 quantity of Product A, B and C and get 20% discount in Product D. In this scenario, the discount applies only if the customer bought at least 1 quantity each in Product A, B and C.
IMPORTANT: This method is most suitable when you have product specific discounts. That is you are offering discounts on selected products based on the purchase dependency. Make sure you choose the method as: Dependent product based discount. In addition to the Any condition, you also have Each and Combine. Each : The system will check if the customer bought specified quantity in each product in the FROM selected box. Example: Buy each 2 quantity from Product A and B, and get discount in Product C.
This is fairly simple. You can either apply a percentage discount or a fixed amount discount. 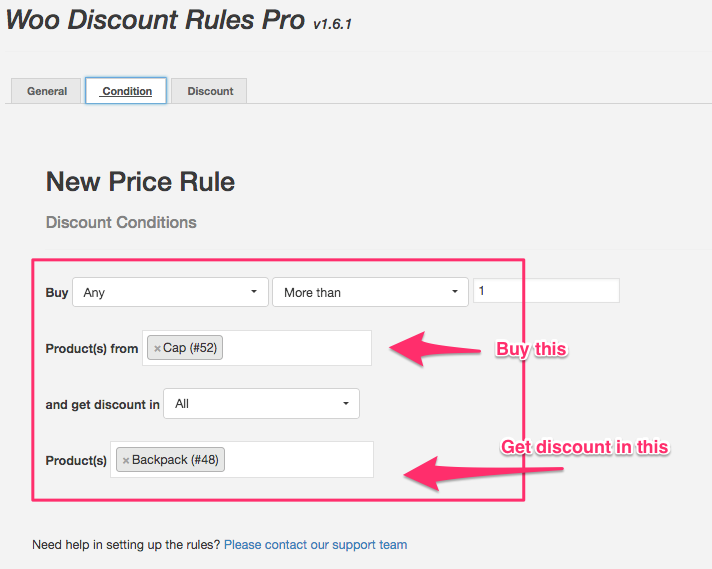 You can find more discount examples and guides by clicking the button below.